Strong. Compact. Maneuverable. That's the Bobcat S450. 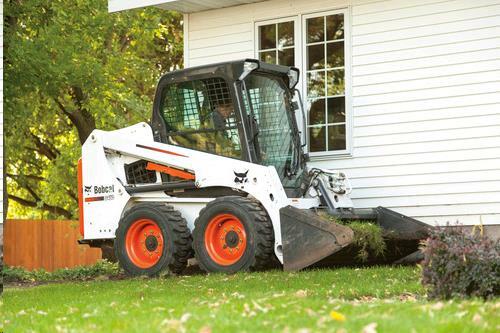 Only 60" in width makes this Bobcat a great performer for its size and the tight, 6-foot turning radius lets you handle big jobs in small areas. It's perfect for a variety of applications such as construction, landscaping, excavating, and much more. Bobcat loaders can spread, dig, lift, carry and load all kinds of material, as well as perform a number of other functions using our attachments. Our Bobcat skid-steer loader s ability to accept a wide variety of attachments makes it the Swiss army knife of equipment. Depending on the tool you attach to our Bobcat, you can use it as an auger to drill a hole, a breaker to demolish concrete, a trencher to dig a trench, a Harley rake to prepare soil or a forklift to move pallets of material. ENGINE KUBOTA DIESEL 49 H.P. * Please call us with any questions you may have about our bobcat e s450 skidsteer in Hamel MN, Plymouth MN and the Twin Cities.